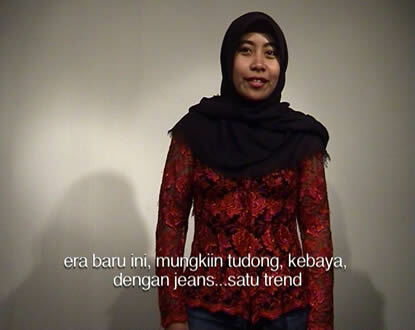 This work is a new development of a recent cross-cultural project previously undertaken in Indonesia and Australia (Through the Kebaya: A Cross-cultural project, Indonesia & Australia). 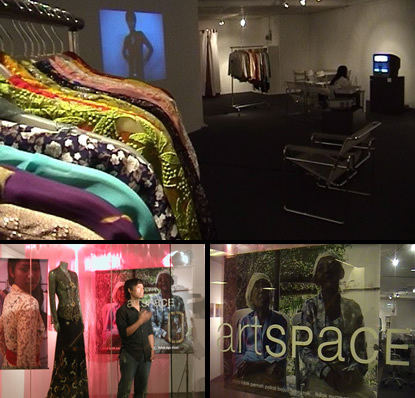 Kebaya and Her Cousins is video performance resulting from the workshop and exhibition ‘Kedai Kebaya’ held at Art Space Gallery in Kuala Lumpur in 2005. The video performance installation, consisting of video, digital prints and objects, expanded upon the earlier project, widening the scope of the enquiry to examine contemporary functions and meanings of the kebaya existing within particular settings in Malaysia. Exiting slightly from earlier work on the topic and responding to the immediate shopping mall environment of the gallery location, this presentation of work was developed collaboratively with local Malaysian designer, Dino. This was both an attempt to shift the assumed function of the contemporary art space towards the more ubiquitous boutique, and to attract new audiences. The work was further developed and presented at Museum and Art Gallery of University Sains Malaysa, Penang in 2006.